Every morning since the storm hit, we could hear a wild animal in the woods crying. We decided to walk around to see if we could find and help it, but of course, it quieted down in fear so we had no luck. As we coutinued our walk, I came across pine boughs with cones scattered on the ground. I decided I would collect those later for use in my winter container gardens as decor. 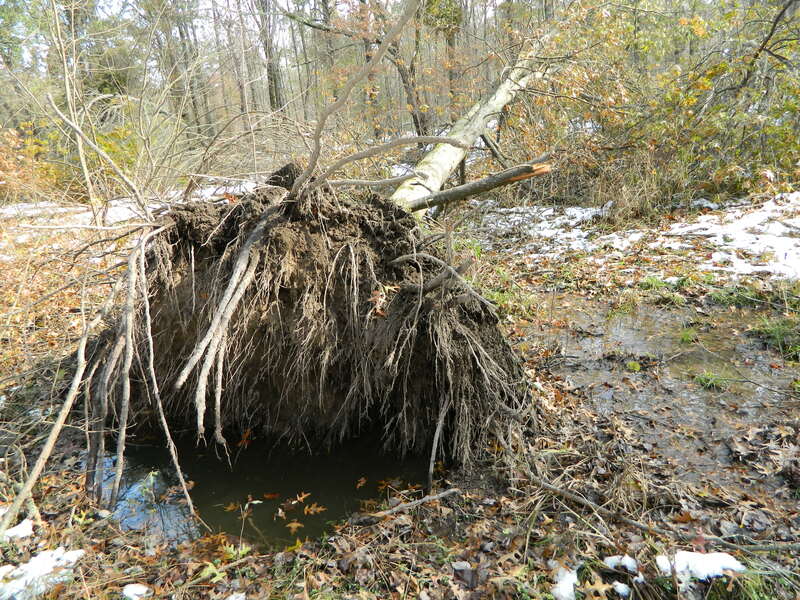 There were trees and limbs broken everywhere and one big tree uprooted completely. This wetland area is often flooded by the Scantic River so our little journey was kept short, but we could see people beyond the river inspecting the other side, a rare sight in our woodlands. They must have been as curious as we were, walking the area to see what impact the storm had beyond their yard. Or perhaps the river was a source of water much needed in homes as the snow was pretty much melted by now. Whatever the reason, it was odd to see people out there. After our woodlands walk, we decided to try the roads again to go visit my parents five miles away. These are times when I am really glad we ended up living close by. They were still without power but my younger brother, Jimmy, got them a generator which was a relief. Having 80 year old parents sleep in the cold had worried us. My mother said Dad was pulling the covers over his head to stay warm, and she wore four layers of shirts, but now the house was warming up a bit. I was less concerned about my father. He has been a resourceful farmer his entire life, and nothing stops him to this day. He is always outside doing a chore of the land. And for this week, on his agenda was cleaning up some fallen limbs from an old, large Catalpa tree in their backyard. It has brittle wood and small branches break from it anytime a windy day comes along, but this time, the torn pieces were rather large, and made the tree look a bit ugly – or should I say uglier? Catalpa trees are not typically valued in landscapes from my experience, but at our family’s home, we valued it very much because it has been growing there since we were kids. It is situated infront of a large hay field framing the view, and it was also a tree I climbed as a kid, and fell out of once, telling no one. We took many photos under it during special occassions. I remember one photo with Rosalie, my kid sister, holding her saxaphone when she was very young; a great photo taken by Louise under that tree. 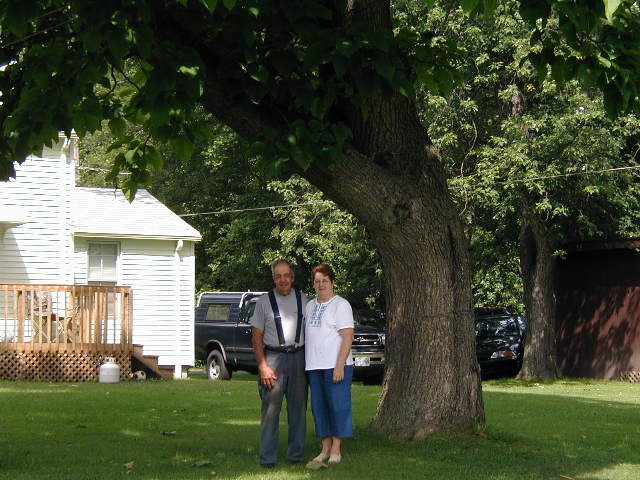 When we celebrated my parents’ anniversary, we took group photos in the yard with the Catalpa in the background and the field with farm equipment beyond that. We also would have to clean the lawn of its littered seed pods, shaped like long capsules resembling giant green beans, every season when we were kids growing up there. Sometimes I would split them open to see the fringed seeds embedded in soft fleshy white tissue. I never cared for the flowers’s scent in the late spring, that to me, had a pungency to them. The white corolla flowers would fall easily onto the lawn every year before the seed capsules grew. In college, I used the seeds from this tree for a propagation lab assignment. I remember my professor saying the trees were practically weeds when I asked if I could select this tree for my project. However, he allowed me to use this tree’s seeds for the project even though the seeds germinate easily without any pretreatment. I guess he figured if I was so attached to the tree, I would be attached to the project’s objectives. Part of being a nature lover is understanding these attachments. Laying the seeds on moistened peat, they grew with practically no effort in the greenhouse. The little seedlings popped up quickly and we pricked them out for transplanting into pots later. When I went with my sister, two months ago to look for her magnolia candidate in a nursery of trees grown by a landscaper, I was surprised he had a Catalpa in his stock. This guy had all kinds of large and mature prized trees growing in a nursery field, not in pots, which he digs up for his landscape projects. 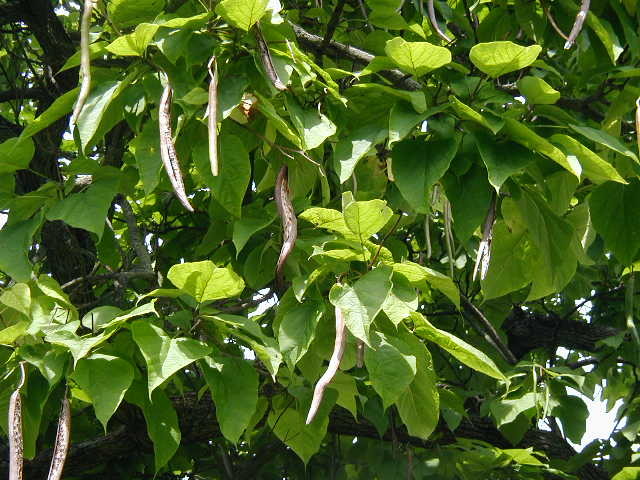 So when I saw it among beautiful ornamental trees from magnolias to speciality Japanese maples, I though perhaps there are other people who appreciate Catalpa trees, or maybe it was just growing there from years before. My parent’s tree survived a storm yet again, and as we sat now at my parent’s kitchen table, we continued talking about stories we’ve heard of long gas lines and the storm’s damage to roads. My sister, Lisa, arrived with Doris, her mother in law. Doris said she felt guilty about getting her power back on today. Only a handful of houses in her neighborhood off Route 5 had it, while all others were dark. She had brought over a batch of cooked food for my parents and we all continued to sit and talk some more. After a couple hours of talking, I eventually suggested we should head back, but my Dad asked us to stay a while longer. This request is something I never heard him ask before. It wasn’t for lack of caring or anything like that – it was only because we always would have something “to do” – to get back to doing, or something distracting our attention to limit time just sitting around talking. But today, we had no reason to rush. So, as a bit of bribery to get us to stay a bit longer, he pulled a bottle of Porto from their cupboard for us to sip. We toasted to surviving Snowlloween on our fourth day of the week. When we finally returned back to our house, I checked the meat packed in two coolers with snow and ice on the north side of the house where shade is constant and temperatures stay the coldest. Then I saw my ‘Bloodgood’ maple tree at the front corner of my house. I had completely forgotten about it until now. This Acer plamatum Japanese maple tree has never given me a second thought with its small and neat habit. It grows upright and has pretty red-purple summer foliage that turns a brighter red in autumn. The fine textured leaves were now all shriveled and torn. Some of the branches were still attached to the ground from the frozen snow. So again, I tugged at the branches and hoped for the best. Another article published in this issue featured …”bold, bright tropical plants with a twist” highlighting a garden artisan in Springfield, Ill, by the name of Adam Woodruff. As the article states, his design style includes “blending soft grasses and perennials with punchy tropical plants.” It covered everything from ornamental grasses to elephant ears with some beautiful photos of his work. See adadmwoodruff.com or gardensBOS.blogspot.com for more about this designer. It drew my attention, for those that know me, know I love that mix of tropicals with perennials in my container gardens too. So with those article prompting thoughts to fill my imagination, I again headed off to bed early. By this point, I was starting to feel really grungy and hoping a hot shower would be coming my way. I wrote down the name of places from the newpaper to take showers and decided tomorrow I would go to one of them. A local church, a school in Enfield, or a shelter were three choices. And perhaps I would take my parents to one of the free dinner places I saw posted on signs. One was a new place in Broad Brook, a catering reception hall, called Merlots. They painted a wooden board with the words, “free pasta dinner tonite”, and I heard through another sister, LaNotte’s Restaurant, a local favorite was offering free pasta dinners too. Soon the meat in our coolers would not be safe to eat. And again, the generosity of local businesses was nice to see and appreciated by many. Hopefully, our power would return by the end of the week, we could only hope and wait.